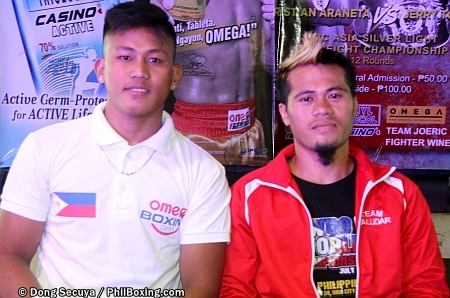 MANDAUE, CEBU -- For tomorrow's (Saturday) Double Rumble co-promoted by Omega Boxing Gym and Championship Development of the Philippines at the Mandaue City Sports Complex, all 14 boxers for the scheduled seven matchups made weight during the official weighin held at the J Center Mall here Friday afternoon. For the vacant WBC Asia Silver light flyweight belt, undefeated Cebuano puncher Christian Araneta (15-0-0, 13KOs) of the Omega Boxing Gym stepped the scales at 107.4 lbs while veteran world campaigner Jerry Tomogdan (25-9-4, 13KOs) of Bukidnon came in at 106.6 lbs. Supervisor of the fight is WBC official Col. Damrong Simakajornboon of Thailand. Jerry Tomogdan (front, left) and Christian Araneta (front, right) pose during Friday's weight at the J Center Mall in Mandaue City. Also in photo from left, Jhack Tepora (partially hidden) GAB official Rolando Mendoza, GAB commissioner Eduard Trinidad, Atty Ramil Abing of the Cebu provincial government, Vic Saludar, Kenneth Rontal, boxing judge Eduard Ligas, Damrong Simakajornboon and boxing judge Arnie Najera. In the co-feature bout for the WBO Oriental super featherweight title, undefeated Jaber Zayani (14-0-0, 1KO) weighed in at the division limit of 130 lbs while his Filipino opponent Eduardo Mancito (16-8-2, 9KOs). The weighin was supervised by WBO vice-president for Asia-Pacific Leon Panoncillo Jr. of the U.S.
Jaber Zayani and Eduardo Mancito touch their heads during Friday's weighin. Also in photo are (L-R): Jhack Tepora, Rolando Mendoza, Eduard Trinidad, Ramil Abing (with WBO belt), Edward Ligas, Kennet Rontal and WBO supervisor Leon Panoncillo Jr. The rest of the weighin was supervised by Cebu GAB official Rolando Mendoza with the presence of GAB commissioner Eduard B. Trinidad. Jobert Alvarez (17-2-2, 7KOs) of General Santos City - 116 lbs. Gerpaul Valero (22-21-4, 16KOs) of Mandaue City - 117.5 lbs. Ponciano Rimandiman (7-4-1, 3KOs) of Leyte - 115.7 lbs. Adrian Lerasan (6-1-0, 1KOs) of Mandaluyong - 114.8 lbs. Marjun Piencenaves (5-0-1, 4KOs) of Butuan City - 122.4 lbs. Jeffrey Stella (4-5-2, 4KOs) of Mandaue City - 121.5 lbs. Carlo Bacaro (1-0-0, 1KOs) of Lapulapu City - 130.5 lbs. Matthew Fondales (debut) of Cebu City - 130.5 lbs. Kawelo Alcos (1-0-0, 1KOs) of Hawaii, USA - 107.4 lbs. Patrick Dakay (debut) of Cebu City - 108.1 lbs. Newly minted WBA world champions Jack Tepora and WBO champion Vic Saludar also graced the event. The weighin was organized by promoters Kenneth Rontal of CBD and Jerome Calatrava of Omega Boxing Gym. Giving their support to the event were local officials Carmelino del Mar, Mandaue City councilor and chairman of the Chartered Day Committee and Atty Ramil Abing, Cebu Provincial government Sports Commission chairman. First bout starts at 6:00 p.m. Saturday at the Mandaue City Sports Complex.